KHUSAT-01/02 – AIR & SSI Lab. 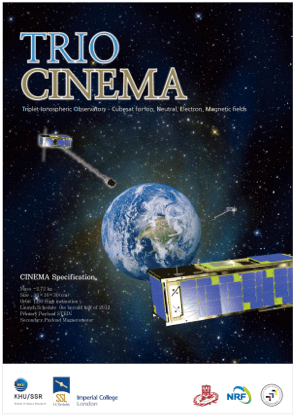 • CINEMA will provide cutting-edge magnetospheric science and critical space weather measurements, including unique, high sensitivity ENA mapping and high cadence movies of ring current ENAs in stereo from LEO. It will also make the 2-point direct suprathermal electron and ion measurements in the auroral and ring current precipitation regions and elsewhere in the magnetosphere, with a single high resolution (~1 keV FWHM) detector with the uniform response from ~2 to ~100 keV; and high cadence 3- axis magnetic field measurements. Furthermore, CINEMA is the development of miniature particle and magnetic field sensors, as well as cubesat-size spinning spacecraft, will be important for future space missions. • Understanding magnetic storms are fundamentally important for space physics. Magnetic storms occur when the ring current is intensified in the inner Van Allen radiation belt. Imaging ring current particles by means of charge-exchanged ENAs [Roelof, 1987] can provide a quantitative global view of the ring current evolution in space and time. • CINEMA will measure precipitated microburst electrons with a single detector continuously across the electron energy cutoff energies around tens of keV, with the energy resolution of ~1keV. These measurements will be made with sufficient time resolution to observe microburst shape and any dispersive effects. CINEMA will also detect 2-15 keV bremsstrahlung X-rays from the microburst precipitation region at <~100 km altitude. The two CINEMA spacecraft observations will allow spacetime separation. • CINEMA will provide in situ electron and ion measurements extending from ~2-4 keV to ~100 keV from a single instrument: CINEMA STEIN. The two CINEMA spacecraft observations will allow space-time separation and stereo viewing of auroral precipitation. This combination enables quantitative evaluation of the precipitation mechanism and measurement of the scale size of the interaction regions. • The magnetometer (MAGIC) will provide the complementary measurements of magnetic fields, waves, and currents required for interpreting the in situ STEIN electron and ion measurements. In addition, the CINEMA measurements of the magnetic fields in low Earth orbit, combined with ground-based magnetometer data and data from upstream spacecraft such as Cluster, THEMIS, Wind, and ACE, will allow the tracking of the phase fronts of ULF waves and flux transfer events (FTEs), quasi-periodic reconnection events at the Earth’s magnetopause, into near-Earth space. The Earth’s bowshock reflects a small fraction of incoming solar wind particles, which can generate large amplitude ULF waves in the upstream, “foreshock” region. These waves can significantly affect the shock, magnetosheath, and magnetopause; the interaction is strongly controlled by the orientation of the solar wind magnetic field. Recent measurements of the flow perpendicular scale of foreshock ULF waves (Archer et al, 2005) suggested the possibility that the recurrence rate of FTEs could be controlled in some circumstances by the arrival of the edges of ULF waves at the shock. We will compare observations against predictions of their orientation and tracking speed based on the upstream solar wind conditions to test this hypothesis for the first time. Since the bursty reconnection process injects energy into near-Earth space, ultimately energizing the radiation belts and generating the aurora, this is a potentially important causal link. CINEMA 2 (KHUSAT-01) and CINEMA 3 (KHUSAT-02). In case of KHUSAT-02, it might be operating(KHUSAT-01 is comfirmed) but can not receive data at KHUGS. We guessed there are attitude and spin axis problems of the CubeSat. KHUSAT-01 and KHUSAT-02, both CubeSats had not response to telecommand. There are some treatment below what we did.